Technology continues to be the top sector attracting investments this year. 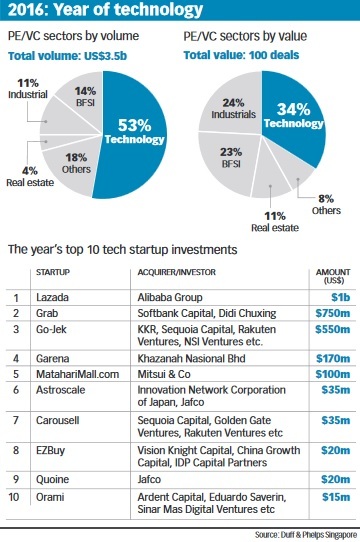 TECH continues to be the top sector attracting investments this year. According to a report by global valuation firm Duff and Phelps, Singapore saw a record value of private equity (PE) and venture capital (VC) investments in 2016, with 100 such deals valued at US$3.5 billion. Of these, tech accounted for the majority of deal volume (53 per cent) and deal value (34 per cent). Srividya Gopalakrishnan, managing director of Duff and Phelps Singapore, told a media briefing on Tuesday that while the number of PE and VC tech investments here increased substantially in 2016 over 2015, the value of such investments has increased only marginally. Among the Republic's most notable tech investments were the US$1 billion acquisition of a controlling stake in e-commerce site Lazada by Alibaba, the US$750 million investment in ride-hailing app Grab led by Japan's Softbank, and Khazanah Nasional's US$170 million investment in Internet company Garena. This is Singapore's best showing in PE and VC activity in the last five years, going by the report. Last year, Singapore recorded 81 investments with an aggregate value of US$2.2 billion. In 2014 and 2013, PE and VC deal values came to US$2.4 billion and US$0.9 billion respectively. Moreover, Singapore is home to two of South-east Asia's largest unicorns. Garena is reportedly the highest-valued unicorn in the region with a US$3.5 billion price tag, while Grab is the highest-funded, having raised a total of US$1.43 billion since its incorporation in 2012. In terms of mergers and acquisitions (M&A), real estate surpassed tech as the top sector in volume and value this year. Real estate saw 150 deals worth US$24.8 billion, while tech had 83 deals valued at US$13.4 billion. Last year, tech topped the list with US$51.6 billion worth of M&A deals compared to real estate's US$16.1 billion. Ms Gopalakrishnan said: "Tech will continue to drive M&A and investments across the world and particularly in Asia. However, there could continue to be price corrections." But she noted that while company valuations will come down, this would be slow and not result in a tech bust as with the 2001 dotcom crash. Asked why M&A activity holds steady even with the global economic uncertainty, Ms Gopalakrishnan said that even if there was a slowdown, companies would in fact be more inclined to pursue strategic growth opportunities. "There's going to be a lot of restructuring and regulation changes - these drive transactions." When asked why the global slowdown did not seem to affect PE and VC activity in Singapore and the region, she said: "The new economy, driven by tech startups, is driving PE and VC deals. We have to differentiate between the new and old economies." Brijesh Pande, managing partner of Tembusu ICT Fund I, told BT that PE and VC investments hit a high in 2016 as South-east Asia's "relatively untapped consumer Internet market" drew significant investor interest. On tech, he said: "Global investment patterns have changed. Most of PE and VC capital is invested in tech companies because tech is impacting almost all industries and in some cases replacing industries entirely." Isaac Ho, chief of private investment group Venturecraft, agreed that tech is here to stay. "All industries are changing their business models as a result of tech, using it to remove administrative burdens, make sense of big data, and create superior user experience - which leads to better customer retention and profit margins." Mr Ho added that manufacturing and healthcare are two sectors primed for further digitisation and investments next year, but this is amid a consolidation of PE and VC activity. "Singapore's startup ecosystem is entering a second phase, where a handful of startups will emerge past Series A and B. Funding for pre-Series A rounds is going to be tougher; more investments will go towards late- stage startups with market traction." For Mr Pande, it is the consumer Internet sector that will see fewer investments in 2017. "Instead, I expect an increase in interest to deploy capital into deep tech and enterprise software companies, which generally have a much lower cash-burn rate."